On Wednesday, October 18, 2017 the Jordan Center hosted a talk entitled, “What Were They Thinking? Russian intellectuals interpret the revolution, 1917-1922”, delivered by Jane Burbank, Professor of History and Russian & Slavic Studies at NYU and introduced by Joshua Tucker, Director of the Jordan Center. This was the second event in the lecture series entitled “100 Year Anniversary of the 1917 Revolution”, hosted by the NYU Jordan Center and co-sponsored by the NYU Department of History. Burbank’s analysis also investigated the views of intellectuals who became known as “Eurasianists,” particularly Nikolai Sergeevich Trubetskoi. Originally a professor at Moscow State University, Trubetskoi was a strong critic of Eurocentrism, which he discussed in his book, Europe and Humanity (1920). He denounced the idea of European universalism, advocating instead for a “multiplicity of civilizations”, equivalent to our modern-day definition of “cultural relativism.” In other words, no culture could be the same as another, as any “borrowing” culture would always have to make enormous efforts to catch up with the West. Trubetskoi and other Eurasianists transferred the focus of the Bolshevik revolution to the East with their 1921 manifesto, Exodus to the East. This publication proposed that culture was moving eastward and that Russians would maintain a special place within the new order. Russians were neither European nor Asian, but rather Eurasian. Trubetskoi predicted the uprising of “real humanity – the people colonized by Europeans. Bolshevism was associated with the notion of “national liberation,” thereby creating a model for other colonial nations. The last category of Burbank’s analysis was a political movement called, “Changing Landmarks”, most notably represented by Nikolai Vasilievich Ustrialov. Ustrialov believed that the Bolshevik Revolution would succeed in reclaiming territories along the borders of the former Russian Empire and beyond. As Burbank noted, “Ustrialov offered no ideological foundation for the great Russian state.” Instead, the ultimate goal for him was expansion of territory, and he considered the Bolsheviks to be the only group capable of instituting a “national imperial revival” in Russia. Betty Banks, a Ph.D. candidate in the NYU Department of History, asked whether or not it was possible to separate the idea of socialism from the context of the Soviet Union. Burbank responded that such a task was challenging, as on some level, the Russian Revolution gave socialism a state form; it materialized the concept of socialism. 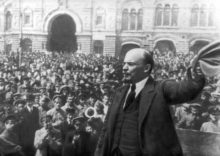 After 1917, there no longer existed a clean slate for a socialist model. Another questioner asked, Did Burbank consider the role of figures on the right? Burbank noted several examples, such as individuals who strongly defended the monarchy as well as anti-Semitic activists who supported conspiracy theories that Jews had started the Revolution. These ideas, too, emerged from the first years of Bolshevik rule.